An easy recipe for Cassoulet from The Bonne Femme Cookbook: Simple, Splendid Food That French Women Cook Every Day. I love cassoulet as much as the next …. cassoulet lover. But really, a true-to-the-Southwest-of-France version could find us chasing all over the Internet for Toulousian sausages and spending major chunks of time making your own duck confit. Yes, it’s well worth the effort if you do have the time. But the promise of The Bonne Femme Cookbook is that you shouldn’t have to chase down elusive ingredients, nor spend days in the kitchen, to cook true-to-France food. French women don’t—so why should you? 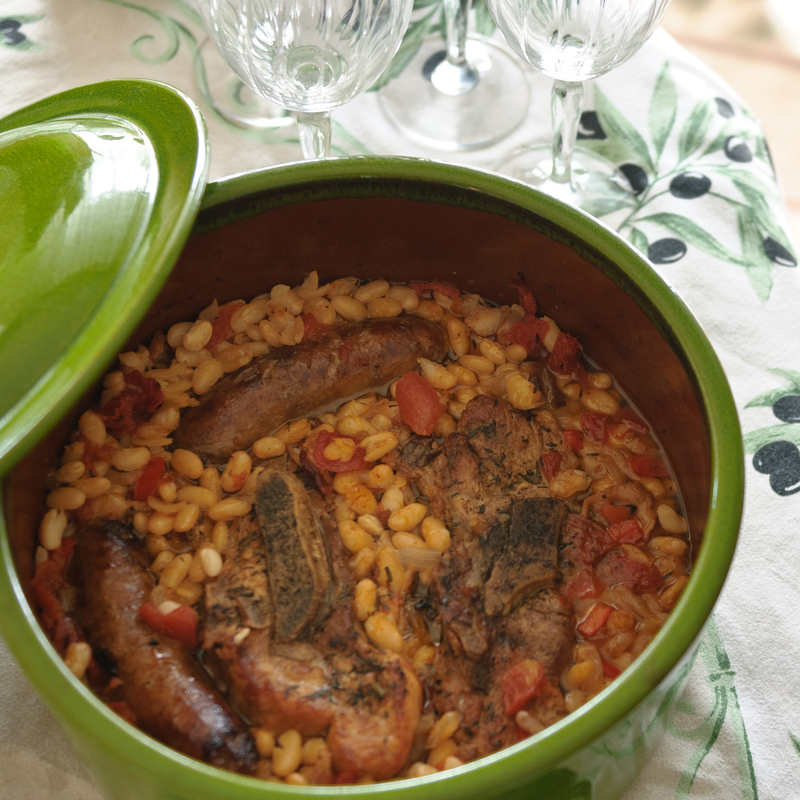 Here is a Cassoulet you can make for dinner tonight. Yes, it takes a little time, but most of it is hands-off simmering. No, it’s not the Southwestern France extravaganza that is a true cassoulet, but it does offer much of the warmth and well-being of this dish. Enjoy! 1. Soak the beans in the water overnight; drain and set aside. Alternatively, place the beans and the water in a large Dutch oven. Bring to a boil and boil for 2 minutes. Remove from the heat, cover, and let stand for 1 hour. Drain the beans and set aside. 2. Season the ribs with salt and pepper. Heat 1 tablespoon of the olive oil over medium-high heat in a large Dutch oven. Add the ribs and cook, turning occasionally, until brown on all sides, 8 to 10 minutes (reduce the heat if the meat browns too quickly). Transfer the ribs to a plate. Cook the bacon in the pan until crisp. Using a slotted spoon, transfer the bacon to paper towels to drain. 3. Drain off all but 1 tablespoon of fat from the pan. Add the bell pepper and onion and cook, stirring, until tender, 4 to 5 minutes. Add the garlic and herbes de Provence and cook, stirring, until fragrant, about 30 seconds. 4. Remove the pan from the heat. Add the sherry and return the pan to the heat. Bring to a boil and boil, stirring to loosen any browned bits from the bottom of the pan, until the sherry is reduced by half, about 1 minute. Add the beans, bacon, chicken broth, and drained tomatoes to the Dutch oven; top with the ribs. Bring to a boil. Reduce the heat, cover tightly, and simmer for about 1 hour (the ribs will not quite be done at this point). 5. After the ribs have cooked for about 45 minutes, heat the remaining 2 teaspoons oil in a medium-size skillet over medium-high heat. Cook the sausage pieces, turning as needed to brown evenly, for about 5 minutes (the sausage will not be cooked through at this point). 6. After the ribs have cooked for 1 hour, add the sausage pieces to the Dutch oven, pushing them down into the stew so that they are submerged. Bring back to a boil. Reduce the heat, cover, and simmer until the sausage is cooked through,the ribs are nearly tender, and the beans are tender, about 15 minutes more. 7. Uncover the pot and increase the heat so that the stew comes to an active simmer. Cook, stirring occasionally, until the liquid is reduced, the ribs are tender, and the stew has thickened, 10 to 15 minutes. Taste and adjust the seasonings. 8. Serve in wide, shallow bowls, with a piece of sausage, a piece of pork, and plenty of beans in each bowl. This recipe is featured on Mycitycuisine.org.